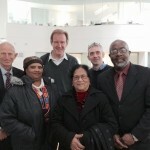 Brighton Housing Trust (BHT) has been awarded a £481,000 grant by the Big Lottery Fund. The money is for BHT’s Accommodation for Work Project. The funding is for five years and comes from the Big Lottery’s Reaching Communities Programme. It will enable the project to help homeless people to move off the streets into independent accommodation and employment. The Big Lottery Fund said: “Brighton Housing Trust’s Accommodation for Work Project provides housing and support for homeless people who want to work but are struggling with the devastating impact of homelessness. The scheme involved three homes, each housing six people, and it previously won £440,000 from the Big Lottery Fund. Bernadette Lynch, project manager of the Accommodation for Work Project, said: “We are so pleased that the project can continue its work to support homeless people in the city to achieve their goals and reach their potential. Clients who have used the project spoke about their experience of the service they received from the Accommodation for Work Project.